Webster's bibliographic and event-based timelines are comprehensive in scope, covering virtually all topics, geographic locations and people. They do so from a linguistic point of view, and in the case of this book, the focus is on "Minoxidil," including when used in literature (e.g. all authors that might have Minoxidil in their name). As such, this book represents the largest compilation of timeline events associated with Minoxidil when it is used in proper noun form. Webster's timelines cover bibliographic citations, patented inventions, as well as non-conventional and alternative meanings which capture ambiguities in usage. These furthermore cover all parts of speech (possessive, institutional usage, geographic usage) and contexts, including pop culture, the arts, social sciences (linguistics, history, geography, economics, sociology, political science), business, computer science, literature, law, medicine, psychology, mathematics, chemistry, physics, biology and other physical sciences. 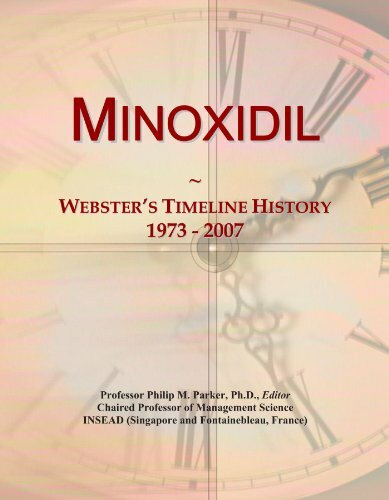 This "data dump" results in a comprehensive set of entries for a bibliographic and/or event-based timeline on the proper name Minoxidil, since editorial decisions to include or exclude events is purely a linguistic process. The resulting entries are used under license or with permission, used under "fair use" conditions, used in agreement with the original authors, or are in the public domain.